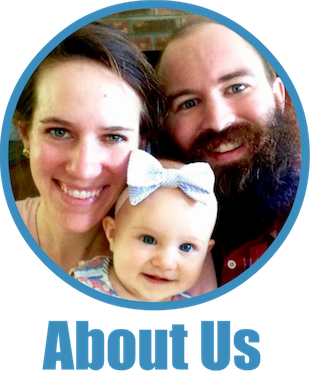 A note to new readers: while we often delve deeply into financial topics (such as Behind the Scenes of a Happy Frugal Marriage and Well Hot Damn, Frugality Works! Our 2014 Savings Rate Revealed), we also like to keep it irreverent and downright silly. 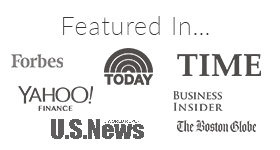 Because hey, who doesn’t need an investigative interview series conducted by a dog?! And so, I hope you’ll enjoy Frugal Hound Sniffs! If you’d prefer a more, ahem, financial independence-related post, start here. Frugal Hound here. 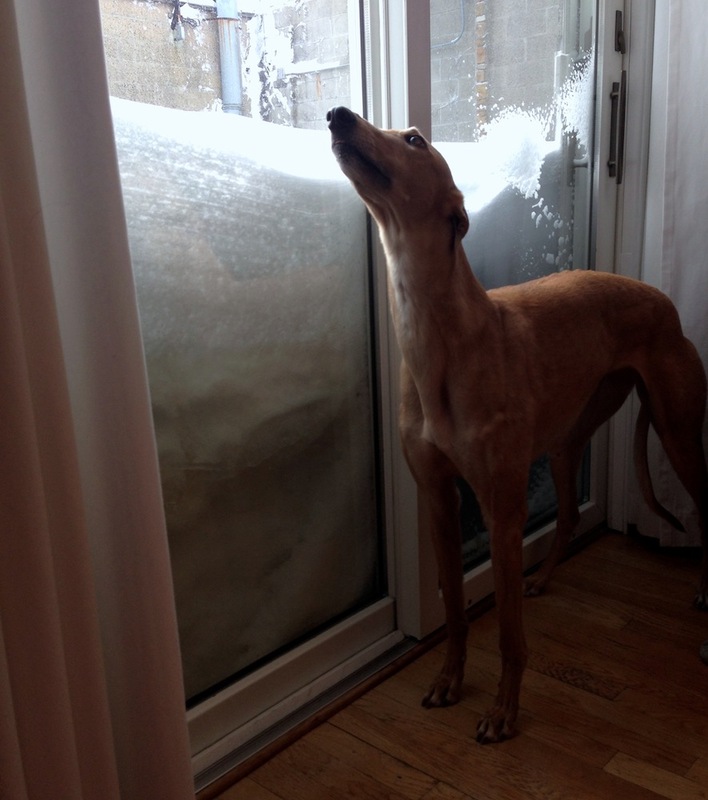 I thought I’d take a break from valiantly summiting snow mountains twice and thrice my size here in the winter wasteland formerly known as Cambridge, Massachusetts to bring you a piping hot new edition of of my erudite interview series, Frugal Hound Sniffs. I’ve just finished licking off all the helpful paw wax Mr. and Mrs. Frugalwoods loving rubbed on my ice-weary paw pads, so I turn my attention to introducing the fabulous Napoleon from Reach Financial Independence. I hope you’ll join me in exuberantly sniffing Napoleon! P.S. He’s a dog, not a horse! Hi, I am Napoleon and I’m a seven months old Great Dane. I live in Guatemala with my mother Pauline, who is a blogger over at Reach Financial Independence. We love going on walks and runs together, and swimming in the lake. 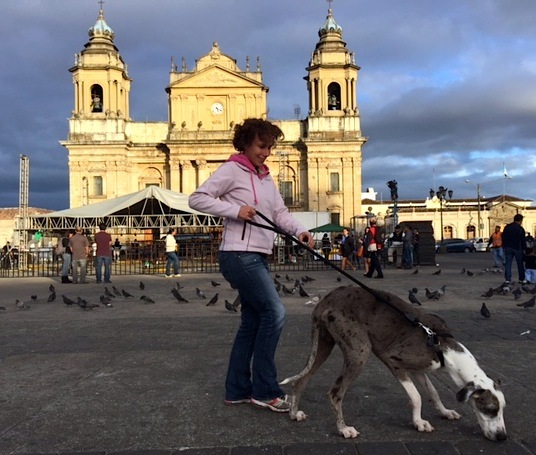 Once in a while, we go on a road trip and stay in Guatemala City for a while, and although I enjoy the colder weather (it’s pretty hot for a Dane around here! ), I get pretty stressed by all the traffic and people everywhere. I grew that much in just 3 months! I’m on a raw diet which consists of raw meaty bones and organs from a variety of meats. At an average of $0.8 per pound, it is cheaper than the imported kibble I was on before, and I like it a million times more! I smell much better, my breath is lighter, and I floss naturally as I chow the bones. I eat beef, lamb, chicken and duck mostly–about 2lb a day since I am so big and still growing. I am pretty low-maintenance as my hair is short, so Pauline brushes me every few days, enjoying the fact that I love it to help me lose my hair outside the house. She bathes me with regular soap and regularly checks me for ticks as we have cattle nearby and I often catch a few. I get my shots at the local cattle store for around $5. Never seen a fancy vet clinic! We go on walks or runs at least once a day and have a handyman working at home who takes care of me when Pauline travels. So while I cost about $600 per year in food, the rest is pretty much nothing. Pauline dreads the day she’ll have to fly me somewhere if we relocate to Europe for example. That should be expensive! I get to share a cookie with my other human while he drinks his morning coffee. Pauline isn’t too happy about me having sugar but I have learned to sit and pretend like I am a well behaved dog thanks to those cookies. I also love raw eggs which I try to steal from the chicken coop a bit too often. Pauline got me a few toys at the dollar store but they quickly became a bit small for me, so my all-time favorite is a $0.10 electric plastic duct leftover from home improvements, closely followed by a turtle carcass I found on a walk. I like the funny noise it makes when I throw it on the ground and I hide some bones inside for when I get hungry. 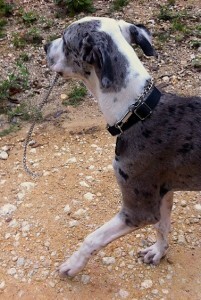 I was so well behaved walking and running right by Pauline’s side that my leash was superfluous. Then one day, I decided to greet a motorcycle a bit too closely and too happily, and the rider and his kid fell on the ground! I was stuck under the motorcycle for what felt like an eternity. Pauline had to pay for motorcycle repairs, the kid’s doctor checkup and antibiotics, and I scratched myself pretty bad too. 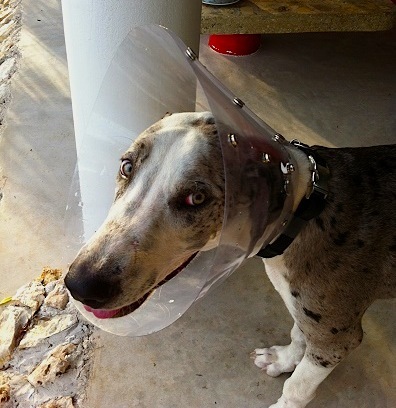 I got that stupid plastic cone around my neck for a week so I wouldn’t lick my exposed skin. That was really expensive, but Pauline didn’t seem as mad as when I chewed her laptop charger! We live in the middle of the jungle and it seemed like a huge deal. My humans were painting the living room red, and I felt like playing around. I even managed to find the bucket with the last bit of red paint. I was red for a week. I live in a hot climate where it’s over 90 on a normal day, so even though it’s recommended for my breed to be washed only a few times a year, I take a weekly bath. I also swim in the lake by myself every day but never smell as fresh as when I get a soap bath. I like the massage part of it, but when it’s over I run around like a crazy dog until I’m dry. I am too young to work, but in the future I may be used to *ahem*… reproduce? since everyone says I am such a beautiful dog. I still need to find the right mate to do that. I love company so I hope we’ll get to keep at least one of them, although I am going to get so big that it’s not a small decision. I also contribute to Pauline’s greatest asset, her health, by making her exercise with me more regularly than she used to on her own. And I am a great stress reliever too. Pauline’s plans are mostly to enjoy life now that she can pretty much do whatever she wants and live wherever she wants. She bought a big piece of land near our home where she is planning a 100 plot development; our house is often a temporary home for visitors from abroad (sadly, no one has ever brought visitors for me! ); and her three blogs keep her pretty busy as well. Is making your heart melt a skill? I am super gifted at reading people and guessing when I need to look extra cute because I am in big trouble. I am working on my hunting skills by running after any hen or duck that has left the coop. I am very good at guessing what is on your plate and if it’s worth my while. And at pretending I am one tenth my size and can still climb on your lap and cuddle. Thank you, Napoleon! You just might be the first hound I’ve sniffed who is much larger than myself! I feel like a downright petite lady next to you. I share your belief that leashes are superfluous (not to mention embarrassing), but my parents disagree. Given the current tundra-esque nature of my homeland, I’d like to come join you in Guatemala! 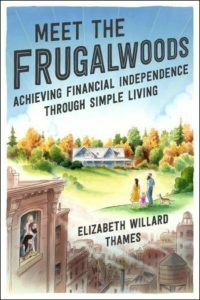 Mrs. Frugalwoods here: Many thanks to Pauline from Reach Financial Independence for assisting Napoleon in crafting his stellar interview. Pauline is a French blogger in her mid-30s who blogs about money, travel, simple and deliberate living, freedom and choices over at Reach Financial Independence. haha last time he had a full pig head in one sitting… when we walk the streets of Guatemala City, parents of smaller dogs often grab their dogs in their arms for fear he would hurt them. Napoleon, what a fabulous life you live – daily swims in the lake! I’m impressed by the raw food diet and even more so by the price of it!! And keep trying to sit in laps. What human wouldn’t be delighted to host what I can only guess is 100+ pounds of canine? You got that right, I think he is around 120lbs now. Re the raw diet, I made best friends with the butcher who keeps everything humans won’t eat, skin, the trimmings, etc. which helps keep costs low, then once in a while I treat him to the real thing. I love your dog posts. I keep asking my dog is she wants to do one, but she just rolls over and asks to be petted… I know lots of FI peeps seem to think pets are a frivolous expense to be avoided, but Mr SSC and I realized with the passing of one of our dogs early this month from cancer, that life without dogs just ain’t cool. lol. What can I say – we love dogs!!! They’re totally worth the expense. Hours and hours of entertainment for a little food and a mattress? Can’t beat that. Yes! They are protected of course but some mean people had already eaten it so the carcass was put to good use! I love Great Danes! A dog that can pretty much look a standing human in the eye without much effort is just really cool. I would have never thought about turtle shells as dog toys, but I bet it is really fun to hide things in there and rattle them around. He learned that just fine, and launching it down the stairs all the way down to the beach, waking everyone up at the crack of dawn. They always enjoy the cheapest/free toys, don’t they?? My mom got their new puppy a bunch of toys from a pet store. The dog is far happier chewing on bark and small blocks of wood left over from a new building we put up. Napolean, I’ve never met a pooch from Guatamala, it’s an honour! I’m glad you’re ok after your motorcycle incident, that must have been scary! oh yes it was, we even thought there were a few broken teeth which would have been really bad, thankfully it was just a bitten tongue that was bleeding. Of course! Sometimes we go to pedestrian Sundays where they close the streets so people can walk and cycle. He doesn’t go for exercise, just for the extra attention! Ah, these crack me up every time! 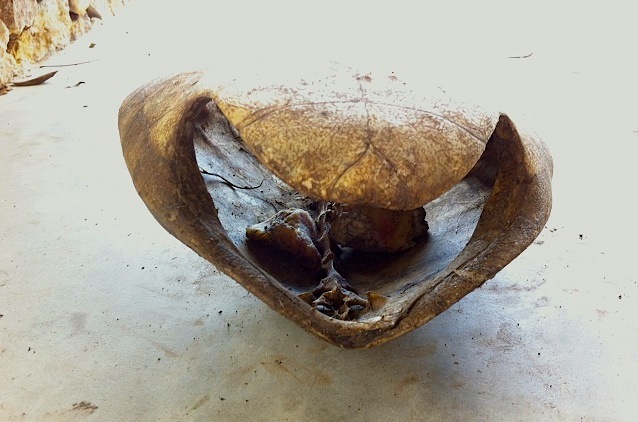 A turtle shell as a play thing… that’s pretty cool. Around here, dropped antlers from elk and deer are highly valued chew toys. That is pretty cool too! The butcher keeps back bones from cows that last for a long time, other smaller bones are chewed and swallowed in no time. Napoleon is so cute. Love all of these pictures! Can’t wait till he’s full grown right! The picture of Napoleon and Pauline is great, love it. Somehow I hope he is not 100% pure and will remain about that height but looks like we have 3-4 more inches to go. The pic was one of his first times in the city, so many smells, noises, birds… he was walking me more than I was walking him. Hey FH, thanks for having us! Stay warm and cozy, if you need some sun, just hop on a plane and pay us a visit! While climbing a volcano, we saw dogs with little boots (just Googled them, looks like Ruffwear makes them) maybe you can ask your grandparents to get you a pair so you can keep trekking in any weather! Thank you so much for being here! Frugal Hound actually already has little doggie snow boots (from her grandparents no less), but she refuses to wear them. She shakes them off or just flat out won’t walk… oh silly hound. Holy Cow Napoleon! I can’t believe how much you grew in three short months! We got to hang out with a Great Dane at the dog park last week. I overheard someone telling his human that this was a dog park not a horse park. Lol! They were kidding of course! haha, they call him the horse around here too! Wow Napoleon you sure grew a lot in a few months. I’m glad that our pet cat doesn’t grow that fast lol. And he does eat accordingly! What a sweetheart! 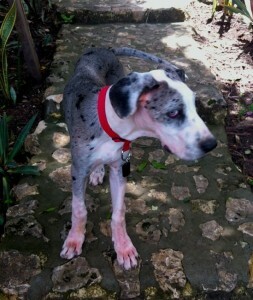 When we adopted our dog last year we thought he might be part Great Dane because he was so lanky and spotted. He looked very much like little Napoleon. Now that he’s older we’re pretty confident he’s not part Great Dane. He’s a big boy, but not as big as Napoleon! How does walking with the leash go for you guys? My 70 lb dog usually walks me instead of the other way around. Isn’t is funny how big dogs don’t realize their true size and always want to cuddle in your lap? They’re so silly! The leash is going ok when we are not in the city, otherwise there are too many fascinating smells and things to explore, you can’t drag him. Probably needs obedience classes or something. He always approaches people and pets very gently, but people do freak out! You sound like a great dog, Napoleon! You do a great service helping your human keep her stress low. We two-legged humans should never underestimate that four-legged superpower of living in the moment. They are such an inspiration, always happy and energetic! Napoleon looks so cute. I have been wanting to have my own hound! Nice Pauline!